LAST YEAR, i thought my garden had a rough season. Apparently it can and does get worse! Monsoon June drowned most of my seeds and seedlings. So i planted some more. It just ain't happening folks. Seems i will have some carrots (they're sprouting, but way behind! ), some onions (not pictured), and some potatoes. VERY exciting crop! Mother Nature has sucker punched me once again. OH- the greenhouse??? How's that doing you say??? Oh no! I haven't even started my veggie garden yet. I fear this is what mine will become even without any bad luck, weather, etc. I just don't have a gardening gift. So glad to hear that noones zucchini has done well - I'm the same - it's odd. I have more than you do in my little garden though, lol. We have tomatoes, beans, spinach, 2 other lettuces, peas are recovering from voles, our carrots are slow, our corn is coming up well, strawberries, and then the chives, leeks and onions are meh. Exactly why I don't garden. 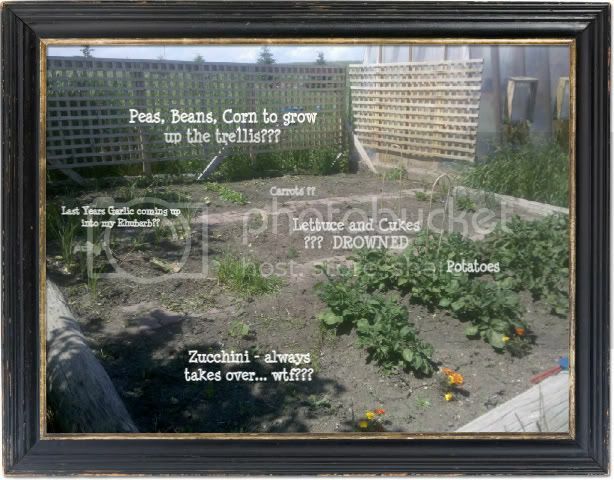 Calgary is the worst climate to garden in :( I wish we could have amazing vegetable gardens here. I don't have a green thumb so I wouldn't even try, but good for you! it looks like some things are doing well! boo to bad garden voodoo!